Today is Human Rights Day and the UN's theme for the day is "Torture and Global Efforts to Combat It". Kofi Annan, the United Nations Secretary-General, reminds us of humanity's objection to torture: "Let us be clear: torture can never be an instrument to fight terror, for torture is an instrument of terror. ... Today, on Human Rights Day, let us recommit ourselves to the principles of the Universal Declaration of Human Rights, and let us rededicate ourselves to wiping the scourge of torture from the face of the earth." Fifty-seven years after the Universal Declaration of Human Rights prohibited all forms of torture and cruel, inhuman or degrading treatment or punishment, torture remains unacceptably common. Recent times have witnessed an especially disturbing trend of countries claiming exceptions to the prohibition on torture based on their own national security perceptions.Let us be clear: torture can never be an instrument to fight terror, for torture is an instrument of terror. The prohibition on torture is well established under international law. It is also unambiguous and absolute. It is binding on all States in all territories under their jurisdiction or effective control. It applies in all circumstances, in times of war as in times of peace. Nor is torture permissible when it is called something else: cruel and inhuman treatment is unacceptable and illegal, irrespective of the name we give it. States must honour this prohibition and vigorously combat the impunity of perpetrators of torture. Those who conceive of or authorize any form of torture and other cruel, inhuman or degrading treatment, and those who commit such acts, should not go unpunished. Nor may any State condone torture by a third party. This means that individuals must never be rendered to another State if there is any danger that doing so may subject them to torture. The international community must speak forcefully, and with one voice, against torture in all its forms. Today, I call on all States who have not done so to ratify the Convention against Torture and Other Cruel, Inhuman or Degrading Treatment or Punishment, as well as the Optional Protocol to the Torture Convention. And I urge all States to allow the United Nations’ Special Rapporteur on Torture independent access to detainees within their control. Unimpeded access is an essential protection for these individuals, whose isolation makes them especially vulnerable to abuse. Together, we must give voice, and redress, to abused detainees as well as to all victims and survivors of torture. Humanity faces grave challenges today. The threat of terror is real and immediate. Yet fear of terrorists can never justify adopting their methods. Nor can we be complacent about the broader prevalence of cruel and inhuman punishment, which in so many of our societies disproportionately affects the most vulnerable people: the imprisoned, the politically powerless and the economically deprived. Instead, we must respond to this evil wherever we find it by reaffirming humanity’s most basic values. 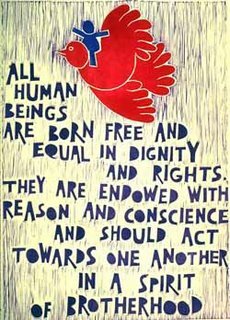 Today, on Human Rights Day, let us recommit ourselves to the principles of the Universal Declaration of Human Rights, and let us rededicate ourselves to wiping the scourge of torture from the face of the earth. Torture is not acceptable. This is a bedrock moral principle in this country. For centuries the common law has set its face against torture. In early times this did not prevent the use of torture under warrants issued by the King or his Council. But by the middle of the 17th century this practice had ceased. In 1628 John Felton assassinated the Duke of Buckingham. He was pressed to reveal the names of his accomplices. The King's Council debated whether 'by the Law of the Land they could justify the putting him to the Rack'. The King, Charles I, said that before this was done 'let the Advice of the Judges be had therein, whether it be Legal or no'. The King said that if it might not be done by law 'he would not use his Prerogative in this Point'. So the judges were consulted. They assembled at Serjeants' Inn in Fleet Street and agreed unanimously that Felton 'ought not by the Law to be tortured by the Rack, for no such Punishment is known or allowed by our Law': Rushworth, Historical Collections (1721) vol 1, pages 638-639. Well, I found the House of Lords judgment refreshing until I got to the arguments on burden of proof. I tend to agree with Bingham and Nicholls that the majority nullifies the principle by placing the burden of establishing torture on the applicant. The applicant being the party before the Court with the least likelihood of being able to meet that burden.